Distraction is often the best cure so encourage children to focus on things outside the car avoiding activities that keep attention inside. It is best not to resort to DVDs or tablets as this can often make car sickness worse so instead opt for audio books or with youngsters, play I Spy and other games that encourage them to look out the window. Make sure the car is properly ventilated and get some fresh air regularly, fresh air calms the tummy. Stopping regularly is a good idea as motion sickness is related to our sense of balance so getting out and walking for a short time can restore that balance. While it is not a good idea to travel on an empty stomach be careful with snacks before you set off so avoid greasy and spicy foods. Drinking plenty of water will help and munching on ginger biscuits will help some children cope with motion sickness. Chewing gum can also help. Anti sickness travel bands apply pressure to a particular point on the inside of the wrist that can bring relief to some. Boots have a range suitable for children aged between 2-12 years. 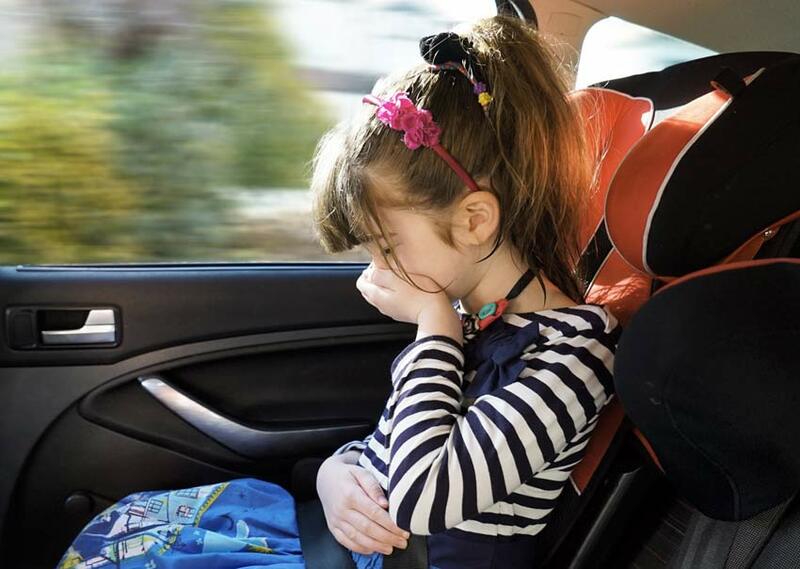 Where you sit in the car can make a difference so move any child feeling queasy to the middle in the back seats so they can focus clearly on the road ahead. On the road the way you drive can help ease the problem so try to drive as smoothly as possible and avoid sudden braking and harsh acceleration. If the problem is persistent talk to your doctor about medications that can prevent motion sickness. It is always best to be prepared with a waterproof bag and a cleanup kit. Include a change of clothes, paper towels, antibacterial hand wipes and a towel to cover the cleaned seat. For a final tip – try to forget that you’ve got to go through it all again on the return journey.